Since 2004, I've published nine GURPS Fourth Edition supplements and several Pyramid articles. Many of these projects were highlights for me as an author. 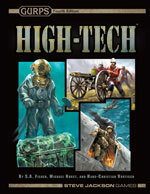 Ever since I was first drawn to GURPS in the 1980s (I bought the first edition of High-Tech before I even owned the Basic Set), I wanted to write GURPS High-Tech, and now it's a dream come true. Based on Mike Hurst's classic and with Shawn Fisher, I still consider it one of my best works. Several of my projects elaborate on the basics set down there, including the two GURPS High-Tech: Pulp Guns catalogs and the upcoming GURPS High-Tech: Adventure Guns. My interest in the minutiae of human conflict resulted in a number of historical works, including a detailed look at combat techniques in a specific time frame in GURPS Martial Arts: Fairbairn Close Combat Systems. The latter was an illuminating and rewarding exercise for me, translating real-world teachings into game mechanics using the marvelous latest edition of GURPS Martial Arts. My favorite historical book is GURPS SEALs in Vietnam, which combined my fascination with that conflict with several alternate-history settings. 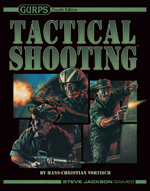 The two books that were the most fun for me to write in those years have to be GURPS Gun Fu and GURPS Tactical Shooting, which I developed and wrote simultaneously – the former together with Shawn Fisher and Sean Punch. To a considerable extent, research for these projects consisted of watching hundreds of films for inspiration and firing tens of thousands of shots from as many guns as I could lay my hands on. My enthusiasm shows, I think, and Tactical Shooting, especially, became a surprise hit with players. Ten good years for me, and hopefully for the game as well.